Orkney’s kirkyards have been in the news recently, when some Orkney Islands Council people decided that gravestones deemed to be loose or dangerous should be laid flat. They hadn’t reached Flotta with their ‘vandalism’ and, hopefully, the chaos they caused elsewhere will be sorted soon. They did say that the gravestones are the responsibility of the family of the person/s commemorated on them, but that’s not always easy to establish. “The alteration of Sanday’s Start Point beacon into a lighthouse, and the erection of houses for the light-keepers, were placed under the management of Mr George Peebles, an experienced mason, and executed with every possible attention. When the works were completed, he and his team went to Stromness, hoping to get a passage south. George Peebles, and the remaining four men, embarked on board a schooner, called the Traveller, bound for Leith. The vessel sailed with a fair wind early on the 24th of December 1806. On the following morning, within sight of Kinnaird Head lighthouse, in Aberdeenshire, the wind suddenly shifted to the south-east, and increased to a tremendous gale, which did much damage to the coast. 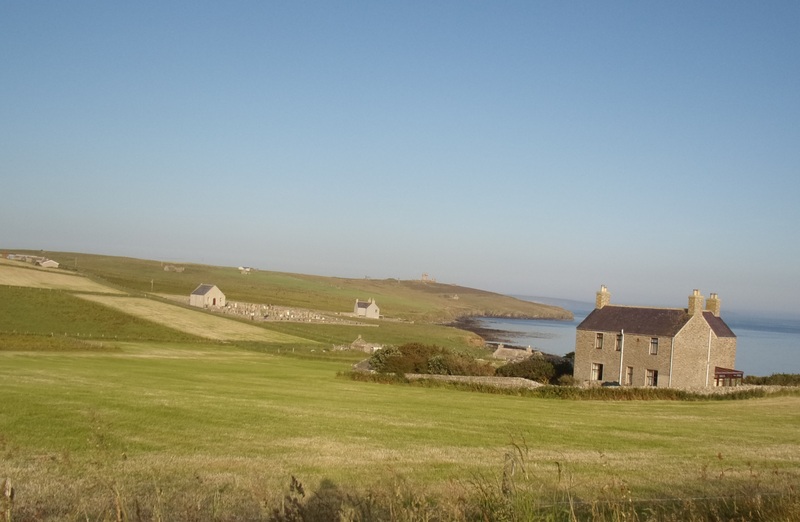 The Traveller immediately put about, and steered in quest of some safe harbour in Orkney. At two o’clock in the afternoon, she passed through the Pentland Firth, and got into the bay of Long Hope; but could not reach the proper anchorage. The storm still continuing with unabated force, at three o’clock, the cables parted or broke, and the vessel drifted on the island of Flotta. The utmost efforts of those on board to pass a rope to the shore, with the assistance of the inhabitants of the island, proved ineffectual; the vessel struck upon a shelving rock, and, night coming on, sunk in three fathoms water. Some of the crew and passengers attempted to swim ashore, but in the darkness of the night, they either lost their way, or were dashed upon the rocks by the surge of the sea; while those who retained hold of the rigging of the ship, being worn out with fatigue and the piercing coldness of the weather during a long winter night, died before morning, when the shore presented the dreadful spectacle of the wreck of no fewer than five vessels, with many lifeless bodies, the mournful subjects of the care and pity of the islanders. In one of these wrecks, all on board were lost; and, in the Traveller, only the cabin-boy escaped. This poor boy, from whom these particulars were learned, had, for a time, been sheltered from the severity of the blast by one of the crew but, being at length left alone, he clung to the top-mast, from which he was with great difficulty removed in the morning, when the storm had somewhat abated. A very trifling circumstance prevented the vessel bound for Anstruther from leaving Stromness along with the Traveller, so that Charles Peebles escaped this gale, and arrived with the sad tidings of the fate of his brother and companions. “… It seems it was about the dusk of the day when the ship struck, and many of the crew and passengers were drowned. About the same hour, my grandfather was in his office at the writing-table; and the room beginning to darken, he laid down his pen and fell asleep. In a dream he saw the door open and George Peebles come in, ‘reeling to and fro, and staggering like a drunken man,’ with water streaming from his head and body to the floor. There it gathered into a wave which, sweeping forward, submerged my grandfather. Well, no matter how deep; versions vary; and at last he awoke, and behold it was a dream! But it may be conceived how profoundly the impression was written even on the mind of a man averse from such ideas, when the news came of the wreck on Flotta and the death of George. On the left side of this stone another stands, belonging to the same family, with a curious inscription in verse. It is worthy of being quoted here, and will be new to many. 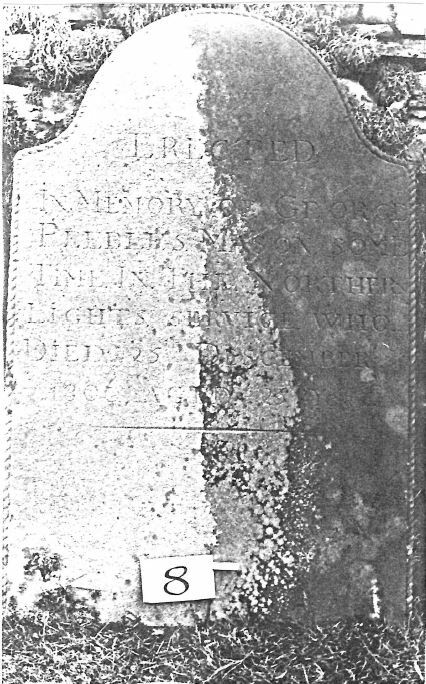 The stone is erected “as a mark of gratitude” to the memory of the wife of James Simpson. The stone erected by William Simpson was not alongside the one with the quote. 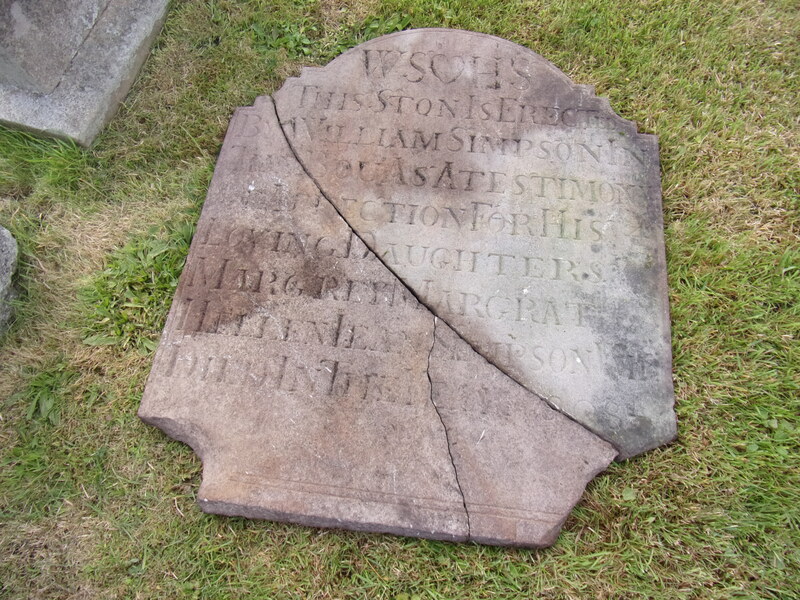 However, three weeks later, when Phyllis and Kenny were back in the kirkyard, they noticed that the grass-cutter had set up a broken stone that had been lying face down and embedded in the earth. Coincidentally, this was the one mentioned above, which had obviously been out of sight for many years but perfectly legible as it was lichen-free, unlike most of those in the old kirkyard. 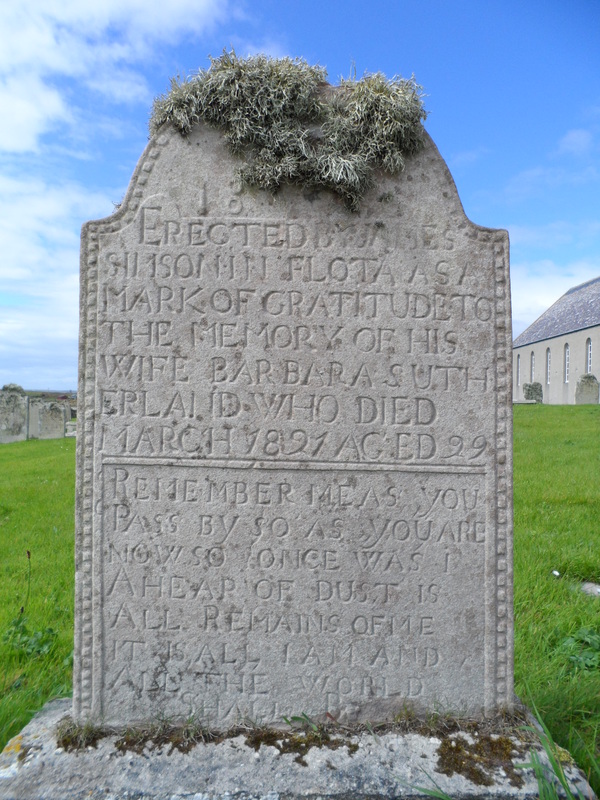 Phyllis did some checks and found that everyone (except the three Sinclairs) currently living on the island, who has Flotta ancestry, is descended from this William Simpson and his wife, Helen Swanson. So who’s responsible for the upkeep of William Simpson’s stone, I wonder? Glad you enjoyed it, Jon. Marvellously moving And lovely too . .